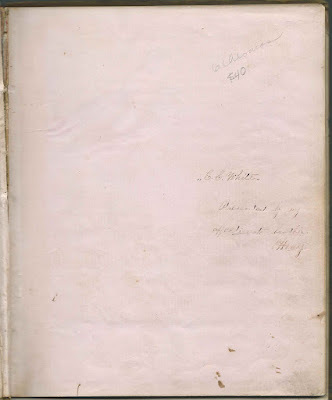 1858-1861 autograph album of Emily C. White of Londonderry, New Hampshire, given to her by her brother Henry Harrison White. 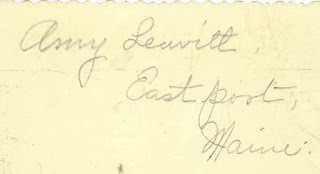 On August 7, 1860, Emily would marry inscriber Samuel Dean Leavitt, a fellow student at Franklin Academy, and move to Samuel's hometown of Eastport, Maine, where at least one of the autographs was acquired. The album measures approximately 8-1/4" by 7" and contains the sentiments of 27 of Emily's relatives, friends and schoolmates. 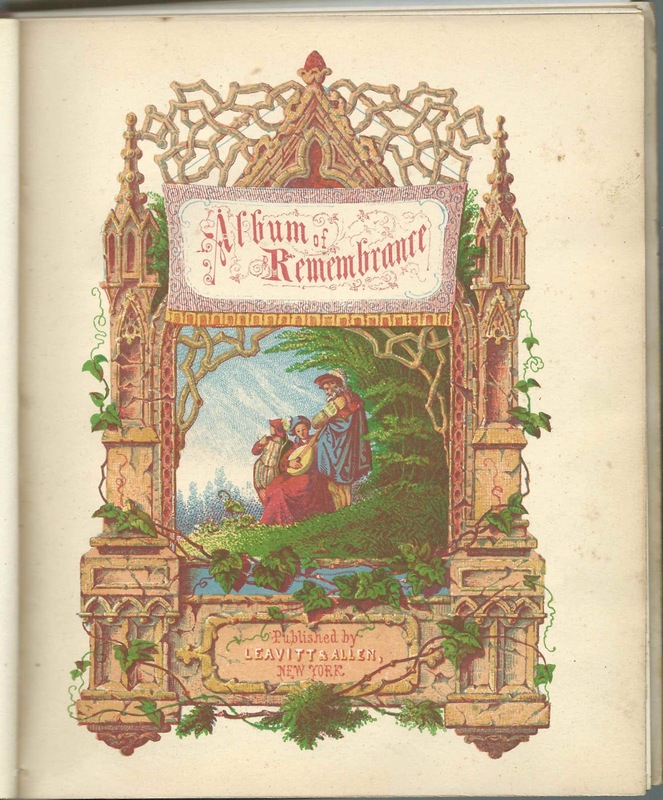 An alphabetical surname list and an alphabetical list of the inscribers, together with any personal information they offered, appear at the end of this post. 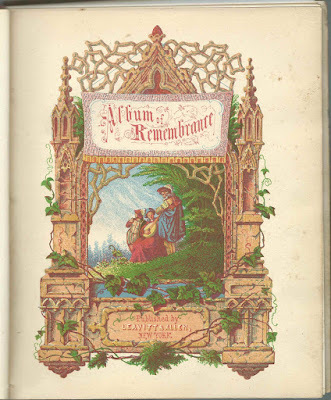 The album, published by Leavitt & Allen of New York City, also contains five full page engravings, in addition to that on the title page. Below, a cabinet photograph of Emily in middle age, taken by the Loring studio of Eastport, Maine. 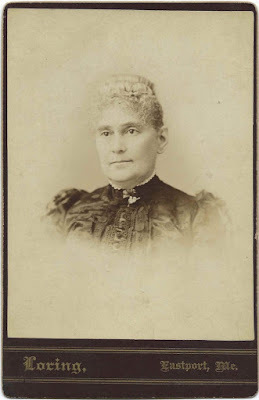 Emily C. White was born October 31, 1836 at Londonderry, New Hampshire, the daughter of Reuben and Rachel (Corning) White. 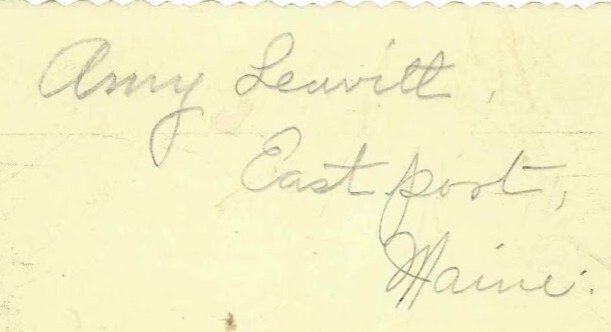 Judging from several of the inscriptions, Emily apparently attended Franklin Academy in New Hampshire, where her future husband, Samuel Dean Leavitt, also shown as Samuel Deane Leavitt, also attended. 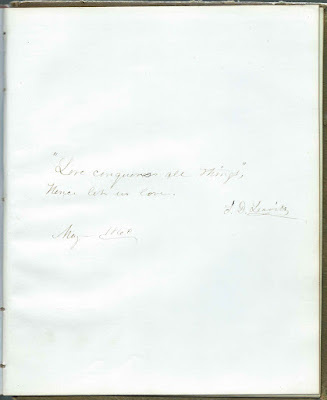 He left an inscription in Emily's album in May 1860, three months before their marriage. 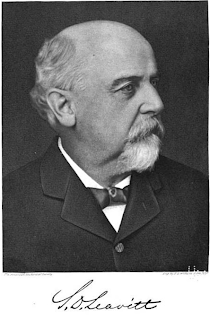 Samuel Dean(e) Leavitt was born August 12, 1838 at Exeter, New Hampshire, son of Benjamin Brackett Leavitt and Harriet (Lamprey) Brackett. Emily and Samuel had, I believe, six children, but it appears that several, if not five of them, died young. 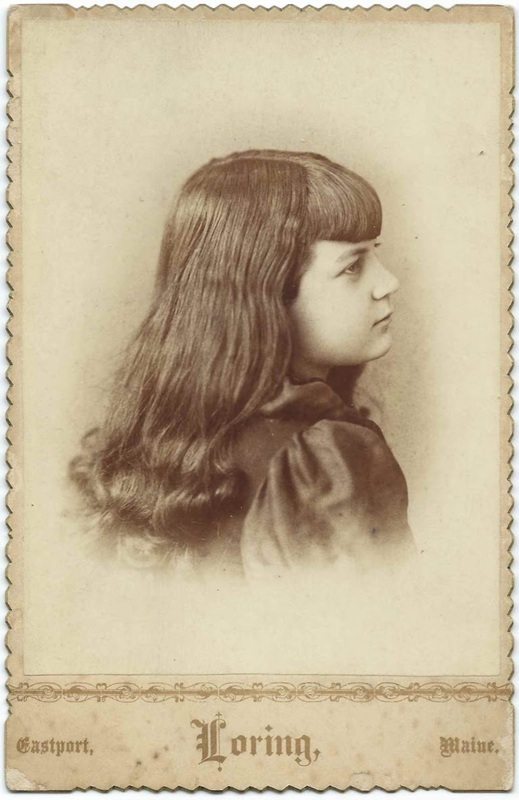 Their youngest, Amy White Leavitt, who married Henry Chapman Waters, is shown below as a child. 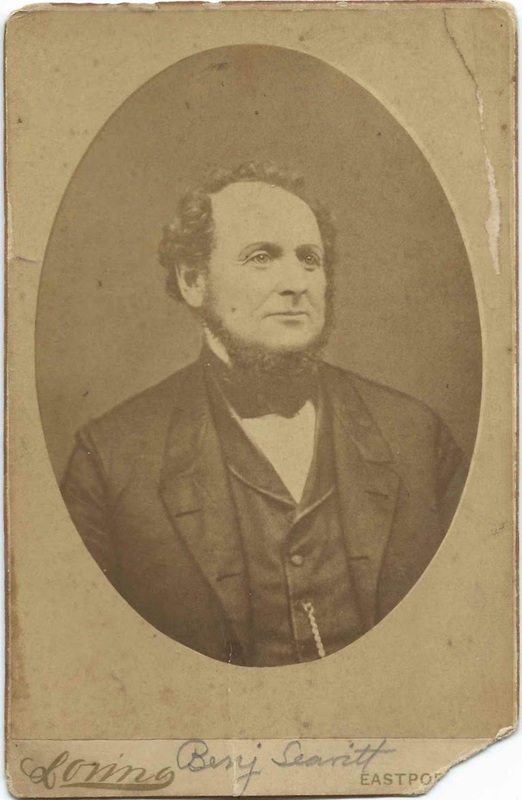 Samuel Dean Leavitt was an influential citizen at Eastport, Maine. Read more about him here in Maine: A History, Volume 4, by Louis Clinton Hatch, published in 1919. 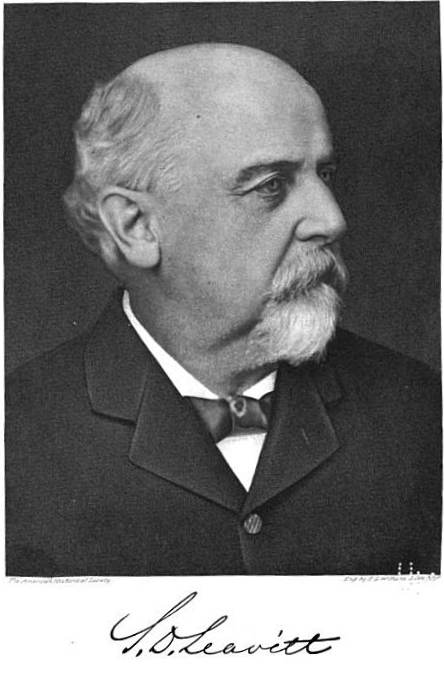 Included in the biography is a photograph of Samuel Dean Leavitt. If you have corrections and/or additions to the above information, please leave a comment or contact me directly. Inscribers in the Album - given names within a specific surname might not be in alphabetical order. F. Esther Baldwin, inscribed at Manchester, New Hampshire, on November 11, 1858. Presumably Frances Esther Baldwin (1837-1860), adopted daughter of Cyrus and Susan Baldwin and future wife of John D. Green. Nute Boyce, inscribed at Londonderry, New Hampshire, on July 9, 1860. Presumably Newell Boyce, husband of inscriber Celinda C. (Flanders) Boyce. Lucy W. C., inscribed at Franklin, New Hampshire in March 1860. Presumably Lucy W. Clark, a schoolmate of Emily C. White at Franklin Academy. She may have been the daughter of Charles and Mary Clark.
? Corning, inscribed at Concord, New Hampshire, on April 18, 1860. Not sure of initial(s) or surname. Perhaps Rt. Corning, for Robert Corning; or R. N. Corning. The surname could also be Comins or ? If R. N. Corning, he might have been Robert N. Corning, a railway conductor at Concord, New Hampshire. S. F. Emery, inscribed on August 5, 1860. She may have been Sarah Frances Emery (1826-1898). Inscriber E. G. Emery may have been Elbridge Gerry Emery, her brother. E. G. Emery, inscribed in May 1860; inscribed to "Dear Madam", so presumably a male. Perhaps Elbridge Gerry Emery (1818-1877). Inscriber S. F. Emery may have been his sister Sarah Frances Emery. Harriett L. Ladd, inscribed at Franklin, New Hampshire, in March 1860. Presumably the Harriette Louisa Ladd born November 11, 1840, the daughter of Dudley and Amanda (Palmer) Ladd. She was a teacher at Franklin, New Hampshire. 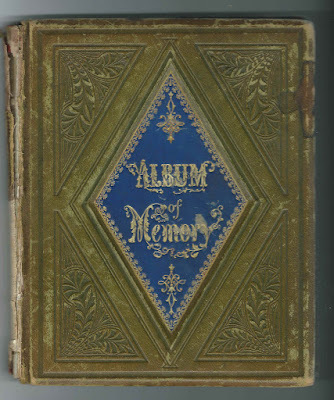 Emily C. White of Londonderry, New Hampshire; album owner. She was presented the album by her brother Henry Harrison White. 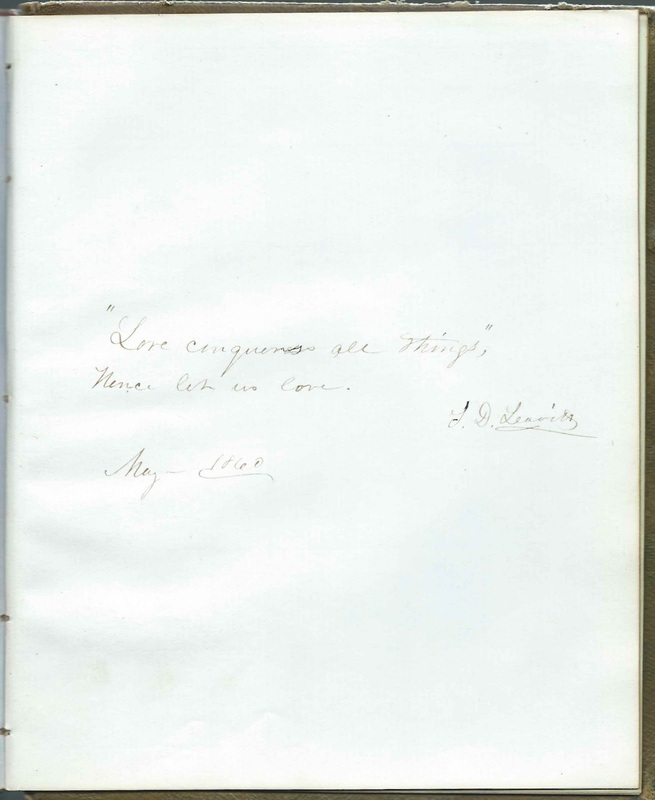 C. G. White, or C. C. White, or ?, inscribed at Londonderry, New Hampshire, on June 24, 1860. Inscribed to "Sister Em". Not sure if the inscriber was a sibling, a sibling-in-law, or if "Sister" was an honorific.